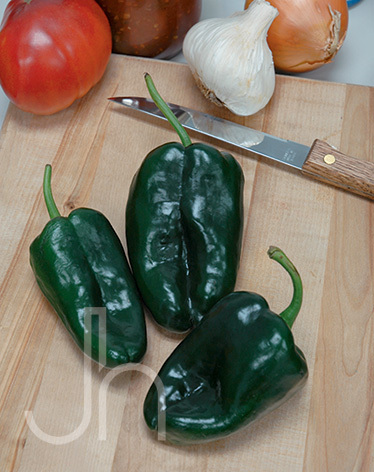 Poblano is the name of the fresh pepper and Ancho is what the dried form is called. Tiburon, a type of Poblano pepper, is large growing to about 7 inches with 3 lobes. You can harvest Poblanos when they turn dark green or leave them to turn red. Compared to the Habanero (215,000 Scovilles) this pepper is relatively mild rating 2,000 Scovilles. Being sensitive to the cold, planting should be delayed until the danger of frost is past in the spring. Ideal temperatures are 70 to 80 degrees F during the day, and 60 to 70 degrees F at night. Usually, the plants set satisfactory crops when temperatures are between 65 and 80 degrees F and the soil is well-supplied with moisture. Avoid a soggy, water-logged soil condition when growing peppers. Outstanding Features: Has a spicy raisin flavor. Resistant to bacterial spot and tobacco mosaic virus. Click here to buy Tiburon (Poblano) Peppers direct from www.buygardenvegetables.com.